The Function Watchdog is the entrypoint allowing HTTP requests to be forwarded to the target process via STDIN. The response is sent back to the caller by writing to STDOUT from your application. The API Gateway provides an external route into your functions and collects Cloud Native metrics through Prometheus. Your API Gateway will scale functions according to demand by altering the service replica count in the Docker Swarm or Kubernetes API. A UI is baked in allowing you to invoke functions in your browser and create new ones as needed. The API Gateway is a RESTful micro-service and you can view the Swagger docs here. 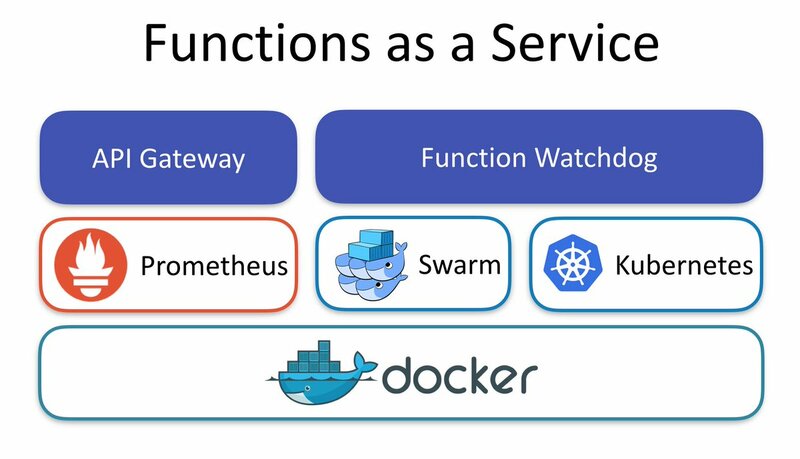 Any container or process in a Docker container can be a serverless function in FaaS. Using the FaaS CLI you can deploy your functions quickly. Create new functions from templates for Node.js, Python, Go and many more. If you can't find a suitable template you can also use a Dockerfile. The CLI is effectively a RESTful client for the API Gateway. You can generate new functions using the FaaS-CLI and built-in templates or use any binary for Windows or Linux in a Docker container. Other Sample functions are available in the Github repository in a range of programming languages. View our guides for documentation, deployment guides and tutorials.